All new accounts start out with a basic library that consists of the most basic foods. You can then build and personalize this library using our extensive food database or by adding your own foods! Your food library can easily be accessed through a our Quick Text Search or by selecting specific food tags. Commonly used foods are stored within your Food Pantry. 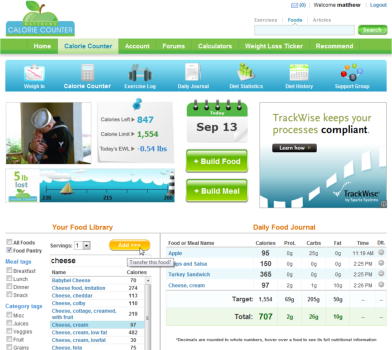 Hover over any food item to see its full nutritional values and any additional food notes entered by you. In addition to tracking Total Calorie Intake, you can choose up to Three Tracking Nutrients that you would like to keep track of. This helps reduce clutter, simplify and fine tune your food journal to your own datary needs. Full nutritional facts for Today's eaten foods are available via your Dietary Statics Page. Your nutrient ratios (targets) are initially set according to USDA Food Guideline standards. These numbers represent the healthy balance of foods your body needs to consume daily to stay healthy. Upload two pictures which will be used to display when you’re within your Daily Calorie Limit and when you go over. This quick visual system will help keep you motivated, on track, and losing weight. We can calculate a EWL of how many pounds you gained or lost each day, and since your last weigh in based on your Total Calorie Intake and Burn. Your EWL will give you an idea of where you stand if you cannot get to a scale.